He also received the teachings on Mipham Rinpoche’s Notes on Nagarjuna’s Mulaprajna and other Madhyamika treatises. Later, he went to Sikkim for five years, where he received various teachings on Prajnaparamita, Madhyamika, Pramana and other sutra teachings from Khenpo Tsondrue. He also received Tantra teachings including Longchenpa’s Trilogy of Self-Liberation and Key to the Treasure - a general commentary to Guhyagarbha Tantra. 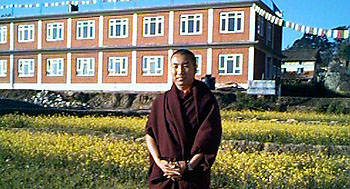 Since the establishment of the institute, he has taught on various subjects including Chandrakirti’s Madhyamakavatara (Entering the Middle Way), Mipham Rinpoche’s Commentary to the Ninth Chapter of Bodhisattvacharyavatara called Ketaka, Mahayanasutralankara (Ornament of the Mahayana sutra), Mipham Rinpoche’s Nge She Dron Me (Lamp of Definite Understanding), Chidon Dzod Gyi Demig (General Commentary to Guhyagarbha Tantra called the Key to Treasure), Lochen Dharmashri’s Sangdag Gongyen (Ornament of Vajrapani’s Intentions - Commentary to Guhyagarbha Tantra) and many other distinct Nyingma Teachings and also many great works of Indian and Tibetan scholars.